It's Facebook Fridays! for October 9, 2015, and as the nights grow cooler it's time for warm embraces ... and hot lips! 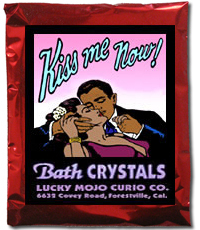 The Lucky Mojo Curio Company is giving away as part of a random drawing 9 Kiss Me Now! Spiritual Supply products to heat up your love life. 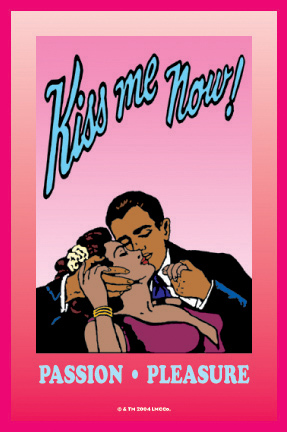 This week the prizes are 3 dressed and blessed Kiss Me Now! Vigil Candles, 3 bottles of hand-made Kiss Me Now! Dressing Oil, and 3 packets of Kiss Me Now! Bath Crystals. First thing tomorrow morning, we will select NINE winners at random, announce their names here, and ask them to message this Facebook Page with their mailing addresses, so we can send them their FREE Kiss Me Now! products. We have a winner! In fact, we have 9 lucky winners! Our Facebook Fridays! winners for October 9, 2015 are: Darice Harris, Terry Newell, Debbie Hall, Kristi Zeiger, William W Glanville, Jessica Braafladt, Lola Shine, Marci Sanders, and Brandi Scott.